Esc instantly closes the game in fullscreen; a prompt appears in windowed mode to confirm exiting the game. Used to be mostly a direct port from the 3DS version which brought in some odd design decisions. 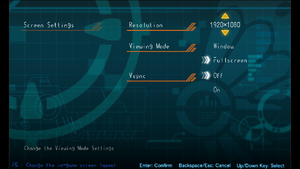 See Widescreen resolution and Input settings for more information. Build 2765014 has brought some improvements from the Nintendo Switch port, including 16:9 widescreen and 60 FPS. The game's original soundtrack plus a bonus track. Extra vocal tracks based from the game. Use Borderless Gaming. The launcher window will be stretched, however the game window will confine itself to the selected resolution. In-game V-sync however may cause frame-rate issues. See Very low frame-rate. Frame rate cap has been raised to 60 FPS as of Build 2765014. Build 2765014 features support for 16:9 widescreen and the menus all fit in a single screen similarly to the Nintendo Switch port. Some assets are directly ported from 3DS version while others are remade in much higher resolution. 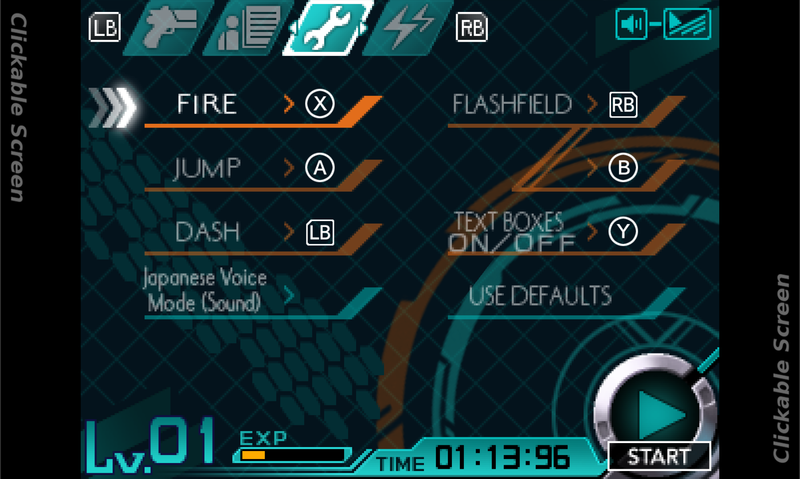 See in-game general screenshot for demonstration, where buttons and text on sides are higher quality than the rest of the assets. Launcher controller rebinding. Keyboard rebinding is identical, excluding right stick skill activation as regular buttons can be used. Xbox/Nintendo button prompts are always shown. Controller uses Japanese style/Nintendo layout where secondary button (DualShock O, Xbox B) is used as an confirmation while primary button (DualShock X, Xbox A) as cancel. Developer is actively trying to solve controller issues and have released several patches to solve controller rebinding issues for multiple controllers. If you are having problems with controller, contact developer via e-mail. Added with Build 795287. Buttons are bound into controller buttons. Skill activation keys are bound to F1-F4 and cannot be remapped. The screen is no longer clickable due to the game being resigned for a single screen. DirectInput only. Remove/disable all DirectInput controllers to use XInput compatible controller. Quitting the game requires Esc or Alt+F4. 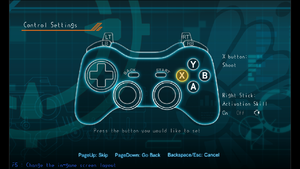 Both launcher (bind controller buttons into Xbox 360 controller buttons) and in-game (change buttons in game action). Prompts however do not reflect on remapped bindings configured from the launcher. 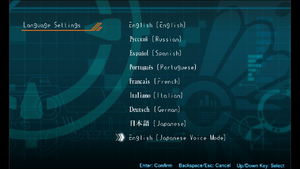 Can be toggled in some circumstances with a button when Japanese Voice Mode is enabled. If Japanese voices aren't selected, almost all cutscene dialogue are cut out. 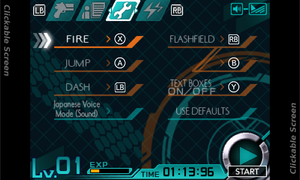 Audio can only be used with Japanese or English texts. This should have been dealt with update Build 756226 and Build 760608. Developer suggests turning off V-sync if the issue remains. 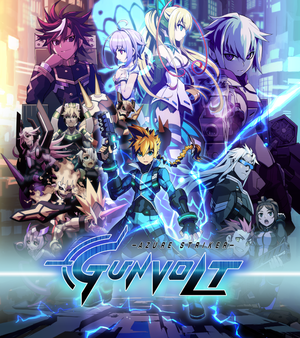 The game would remain running in the background despite closing the game down. This issue should be addressed with Build 2770885. ↑ 2.0 2.1 File/folder structure within this directory reflects the path(s) listed for Windows and/or Steam game data (use Wine regedit to access Windows registry paths). Games with Steam Cloud support may store data in ~/.steam/steam/userdata/<user-id>/388800/ in addition to or instead of this directory. The app ID (388800) may differ in some cases. Treat backslashes as forward slashes. See the glossary page for details. Tested Borderless Gaming on the game, and despite the initial launcher being stretched, the game window rendered properly running in the native desktop resolution. Although its possible to swap A and B buttons for better menu controls, not all modes and menus will work with the changes made in the configuration launcher nor changes from in-game Options.